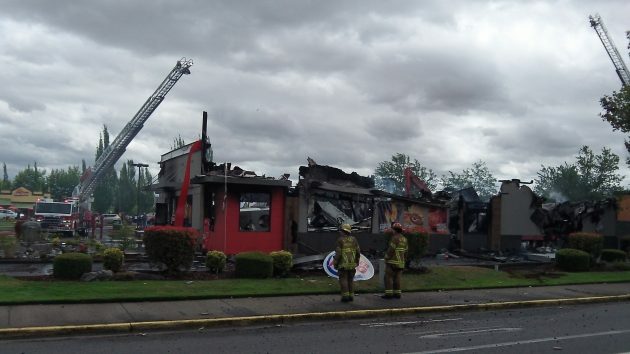 The way the Burger King fire scene looked on Saturday afternoon. The department also said the property was valued on the county tax rolls at $1.1 million. Destruction of the restaurant was obviously a huge loss, and now we know how huge. Hope that all involved can find a break to daylight…..
A little more info appeared in the D-H this morning. The gasoline was needed for a pressure washer and BK has been placing employees at “other franchises.” I’m pretty sure the loss will be covered by insurance so we’ll likely see another building there soon.